Every year, there comes a time that reminds us of one sweet little boy who came to this world to teach us love and peace. 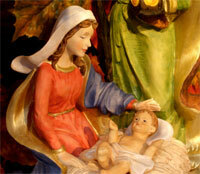 We celebrate the birth anniversary of that special baby as a joyful festival called Christmas. Know all about the interesting origin of the Christmas festival and click here to forward this page to all your friends and loved ones to let them all learn about it too. Wish you a merry Christmas and a joyful festive time! Celebrated every year on the 25th day of December, Christmas is a festival that is observed in almost every nation around the world. Primarily a religious occassion, it is also a time of celebration not only for the followers of Christianity, but also all those of us who love the ideals of peace and brotherhood. The birth of the Christmas festival is believed to have its roots in an incident that is said to have occured nearly two thousand years ago in Bethlehem, a small town near Jerusalem, the capital and largest city of the modern state of Israel where an unmarried couple were soon going to have a baby. The poor couple could not find any accomodation in an inn and they were forced to spend the night in a local stable. It was here that the woman, Mary, gave birth to a son in the presence of her would-be-husband, Joseph. They named the child Jesus Christ. "A child is born to us! A son is given to us! And he will be our ruler." And true to these predictions, Jesus grew up to be one of the greatest spiritual leaders the world has ever beheld. At an early age, he attained spiritual wisdom and understood that he was born to show mankind the true way of living, so that those born on earth can gain spiritual perfection in this world and be united with god in their afterlife. He travelled various places and despite criticism and hostility, tried to show people the way to God. Many accepted his teachings and his followers increased every day. However, his words went against the interests of many rulers. Historians believe that it was Pontius Pilate, the Roman prefect who governed Judaea from 26 to 36 AD/CE, who ordered his execution on charges of heresy. Betrayed by one of his own disciples, Judas Iscariot, Jesus was arrested and crucified to death. But Christian scriptures and the Holy Bible mention the miraculous incident of Jesus getting back to life, three days after his demise, which again fulfilled an ancient prophecy which correctly predicted that the "Son of God" was to rise after his death and show mankind that life was possible even after expiry. This strengthened the faith of many followers of Jesus and they established a religion, Christianity, named after him and based on his teachings and propagated ideals. Four hundred years after Jesus' death, Christianity began to be recognised as an important religion and it is one of the prominent faiths of the world today. Christians as well as many non-christians hold the birthday of Jesus Christ dear to their hearts and celebrate it annually on December 25, which is not the actual birth date of Jesus, but is supposed to closely correspond to the real day of his birth. Every year, it is celebrated with great fanfare across the world and marks the beginning of the religious season of Christmastide, which lasts for twelve days.